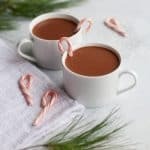 This Rich Peppermint Hot Chocolate is drinkable perfection for a cold winter day, and more nourishing for your body than the stuff with the little fake marshmallows from the packet. Whipped cream, marshmallows, sprinkles, and candy canes, optional for garnish. In a small saucepan over medium-low heat, combine the maple syrup, coconut milk, and salt. Bring to a simmer, then remove pot from heat. Stir in the chocolate, and continue stirring until the chocolate is completely melted. Stir in the vanilla extract and peppermint extract, starting with 1/2 teaspoon of the peppermint and adding more if desired. Pour into four mugs, and top with whipped cream, marshmallows, sprinkles, or candy canes (if desired).